I’ve been testing the Verizon Droid for the past few days, and it’s an awesome phone. But even though I’m eager to ditch my iPhone and eighty-six AT&T, I’m not going to switch to Verizon for the Droid. Don’t get me wrong: I am very impressed with what Motorola has built. 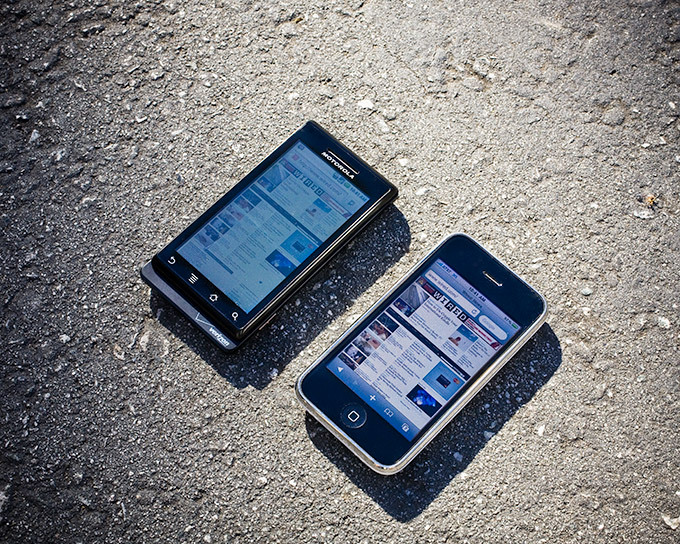 In my mind, the Droid and the iPhone are the two best smartphones on the market today. The Droid can compete with the iPhone in almost every respect. Voice-call quality is much better than on the iPhone. Callers sounded crisp and clear. And I was able to set up Google Voice to work with both incoming and outgoing calls and SMS messages — something you cannot do with the iPhone. For that matter, since all of my contacts, calendars and e-mails are hosted by Google now, setting up the Droid to work with my information took me less than five minutes. Because I have more than 3,000 contacts it took the Droid nearly an hour to sync them all to the phone over the 3G network (and during that time, the phone got alarmingly warm), but I never had to install desktop software or even plug in any cables. The Droid also uses Verizon’s 3G network, which in my ad hoc testing came out ahead of AT&T’s. Downloads seemed faster, and the data connections were generally more reliable. It still dropped one of my calls, as I was riding the commuter train, in almost exactly the same spot where AT&T inevitably drops my iPhone calls. Without further side-by-side testing I can’t definitively state whether the Droid on Verizon’s network trumps the iPhone on AT&T’s, but my sense is that it generally does. In terms of interface and features, the Droid is the first phone that’s truly comparable to the iPhone in terms of power and ease of use. There are interface differences, but for the most part they’re not better or worse, just different. Multitouch is the most glaring omission, which means you can’t pinch to zoom the screen. But, like the iPhone, you can double-tap to zoom in, and the Droid is similarly smart about sizing the screen to fit whatever column of text you want to read. Its onscreen keyboard works almost exactly like the iPhone’s, and is even superior in that you can choose among multiple type-ahead suggestions rather than just waiting for the phone to suggest the one you really want. And while there are only about 10,000 Android apps, compared with the iPhone’s 100,000, there seems to be plenty of selection. The Android Market should be more than enough to keep me happy, with a couple of exceptions. The reason I’m not switching to the Droid is twofold. First, the hardware keyboard troubles me. It’s not especially good, and I worry that the slide-out mechanism could be prone to failure. There’s no way to confirm that other than heavy use for three to six months, but it’s a risk I’m not quite ready to take — especially because the onscreen, virtual keyboard is so good. With such a good virtual keyboard, the hardware keyboard seems like an unnecessary and even dangerous, trouble-prone appendage, like an appendix or a vestigial tail: It can only cause problems. Plus, it adds weight; the Droid, at 6 ounces, is about 2 ounces heavier than the iPhone. So I’d rather wait for a lighter, keyboard-less version of the Droid. The second big reason is that I’ve grown dependent on two iPhone apps: Instapaper Pro and Tweetie. I also occasionally use RunKeeper, Stanza, Pandora and a handful of games, but Instapaper and Tweetie are the killer apps. They’re the things that, together with e-mail capability, make the iPhone useful to me. Tweetie I could probably learn to live without: There are plenty of Twitter apps for Android, and the most popular one, Twidroid, seems to work fine, even if it lacks Tweetie’s elegance and speed. But Instapaper’s ability to collect, reformat and display news articles and blog posts I want to read — even if I’m offline — has made it an indispensable commuter and downtime companion. I would sorely miss it. So while I’m no fan of AT&T or Apple, I’ll be sticking with the iPhone now. It’s one of the two best smartphones on the market, and it’s the only one that has the apps I depend on.